Last night, I finally got around to watching the latest episode of "The Mentalist", one of my favorite shows on TV right now! The episode featured a church/cult, whose HQ looked mighty familiar to the Super-Sentai fan boys out there. I had no idea (NONE!) that this was a real building. It's called the "House of the Book", which is really a futuristically designed building on the Brandeis-Bardin Campus of American Jewish University. This building has been used by a lot of TV shows and movies over the years. You can see it in "Tenacious D in The Pick of Destiny", Marilyn Manson's "Dope Show" music video and "The Lawnmower Man". And, of course, the "House" was used as the Power Rangers headquarters from "Mighty Morphin' " thru "Power Rangers Turbo". Who knew? is there a place like the power ranger command centre/ house of book in sydney, australia? It's also featured in Star Trek TNG's Descent episodes (end of season 6/ beginning of season 7)! It's also in Chris Brown's music video, "Wall to Wall." 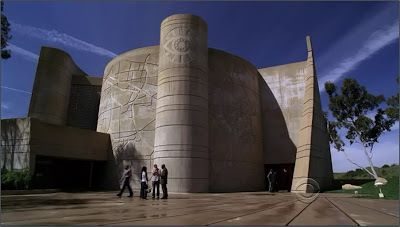 It starts out with Brown driving to the building and it's a stormy night, and when he gets to the building, the song starts and they start dancing and go inside, and the inside of the building in the music video is just like what we saw on The Mentalist.